Kraft Foods Inc. released its annual proxy statement yesterday which serves as timely illustration of the faulty logic that compensation committees regularly use when setting executive pay levels. As we discussed last month, compensation policies can encourage executives to pursue value destroying mergers. 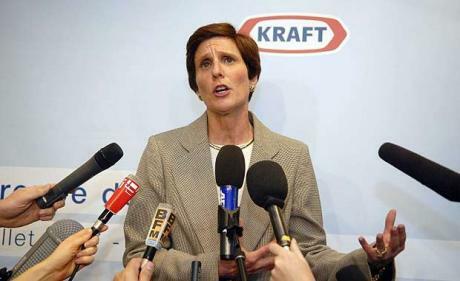 Kraft CEO Irene Rosenfeld earned $26.3 million in total compensation for 2009 with significant components granted due to “exceptional leadership” that resulted in closing the Cadbury acquisition in February. This is the same “exceptional leadership” that resulted in Warren Buffett taking a rare public stand against the actions of a manager in which Berkshire Hathaway holds minority positions. Berkshire Hathaway is Kraft’s largest shareholder. Led the combination of Kraft Foods and Cadbury, which transformed the portfolio into faster growing categories and geographies. The Committee assessed Ms. Rosenfeld’s leadership in executing on the formal bid for Cadbury in November 2009 and closing this complex deal in early 2010 as exceptional; and The Committee specifically noted her commitment to financial discipline as evidenced by maintaining our investment grade rating, accretion to cash earnings in the second full year, and our current dividend. Led the divestitures of businesses that continue to transform the portfolio. Divested the North American frozen pizza business in the first quarter of 2010 for $3.7 billion; and Divested several slow growth small businesses during 2009 that generated approximately $0.04 of incremental EPS. As for Ms. Rosenfeld’s base pay, the company notes that her salary is “below the size-adjusted median of the Compensation Survey Group”. Presumably, Kraft’s larger size in 2010 following the Cadbury acquisition will result in the company being placed into a larger peer group that will lead to higher base salary recommendations in the future which would illustrate the incentives managers have to grow the size of a business regardless of returns on incremental capital. I feel poorer. (Laughs.) Kraft, in my judgment, well just in the past two weeks there’s been two things that caused me to feel poorer. They sold a very fine pizza business and they said they got 3.7 billion for it. But, because it had practically no tax basis, they really got about 2.5 billion. They sold a business for 2.5 billion that Nestle is willing to pay 3.7 billion. Now can Nestle run it that much better than Kraft? I doubt it. But that business that was sold for 2.5 billion earned 280 million pre-tax last year. But they sold that at less, right around nine times pre-tax earnings in terms of their own figure. Now they mentioned paying 13 times EBITDA for Cadbury, but they’re paying more than that. For one thing, EBITDA is not the same as earnings. Depreciation is a very real expense. But on top of that, they’ve got a billion-three they’re going to spend of various rearrangements of Cadbury. They’ve got 390 million dollars of deal expenses. They are using their own stock, 260 million shares or something like that, that their own directors say is significantly undervalued. And when they calculate that 13, they’re calculating Kraft at market price, not at what their own directors think the stock is worth. So, the actual multiple, if you look at the value of the Kraft stock, is more like 16 or 17 and they sold earnings at nine times. So, it’s hard to get rich doing that. It appears that Kraft’s Board of Directors is content to embed misleading information regarding divestitures in the proxy statement in an attempt to justify a very rich pay package for a CEO who presided over significant value destruction leading the company’s largest shareholder to “feel poorer” as a result. However, one can hardly blame Ms. Rosenfeld for her actions. She knew that the executive compensation policies would reward this type of action and was only acting according to the incentives that the Board provided. The compensation committee members during 2009 were Ajaypal S. Banga, Myra M. Hart, Lois D. Juliber, Mark D. Ketchum, and Deborah C. Wright. Alternatively, shareholder can vote with their feet by selling their shares. If the company’s largest shareholder cannot prompt common sense corporate governance, it is doubtful that smaller shareholders could achieve better results. Disclosure: The author owns shares of Berkshire Hathaway which owns approximately 8 percent of Kraft common stock. ← Taco Bell Expands to India: Paneer and Potato Tacos?